Back in 1952, and after winning his third Oscar, the master filmmaker Billy Wilder faced a new challenge: making a movie nobody expected from him. Ace In The Hole, starring Kirk Douglas, was a pessimistic tale dealing, among other things, with the eternal question of how much the end justifies the means, attacking both the mass media and its audience, and thereby attacking the very same viewer of the film. Over 60 years after its release, this masterfully crafted screenplay still feels fresh and is one of those rare films that does not age. What’s It About? Chuck Tatum (Kirk Douglas) is a frustrated journalist stuck working for a boring Albuquerque newspaper. When he hears about Leo Minosa (Richard Benedict), a man trapped in a cave, Tatum exploits the story to re-launch his career. The situation quickly escalates into an out-of-control circus that leads to some dramatic consequences. Sensing a golden opportunity, Tatum manipulates the rescue squad, the unscrupulous sheriff and the construction contractor charged with the rescue in order to prolong his stay on the front pages of newspapers nationwide. Lorraine (Jan Sterling), the victim’s wife, is the only one who sees through him, and yet she goes along with the reporter’s scheme. And so does Herbie Cook (Robert Arthur), the newspaper’s young photographer, who slowly loses his idealism as he follows Tatum’s path of ambition. Verdict: “They were expecting a cocktail and I gave them a shot of vinegar,” says Wilder himself during an interview featured on the extras of the DVD. Ace In The Hole is a brilliant movie but not an easy one to watch, as it asks the audience some very uncomfortable questions. To what extent do the mass media and politicians manipulate and control public opinion? How far can a man go when he’s driven purely by ambition? These are just some of the themes explored by Wilder and his co-writers in this Oscar-nominated screenplay. If you think about it, the protagonist has no real nemesis; the only real threat to Tatum is himself. And yet, even though he is a character full of appalling flaws, the audience can’t help but somehow feel attracted to this man. Kirk Douglas, under the masterful direction of Billy Wilder, portrays Tatum with a certain vulnerability that makes the audience follow him down a road that everybody knows will have a dark end. Jan Sterling’s character is the only one who sees through Tatum’s facade. Her character has some of the best lines and her relationship with Tatum is a brilliant subplot that helps to move the story forwards. Extras: A 30-minute analysis of the movie, a one-hour documentary about Billy Wilder – featuring a brilliant interview with the director at his office – and a 40-page booklet with a new essay, vintage material and rare archival imagery. Final Words: An uncompromising masterpiece that attacks mass media and journalism with a terrific performance by Kirk Douglas and brilliant direction by Billy Wilder. 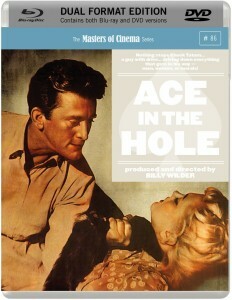 Ace In The Hole is out on DVD and Blu-ray now.